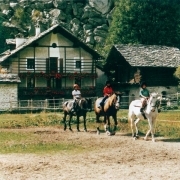 In front of Villa Margherita short distance from the historic centre of St. Jean - Gressoney. 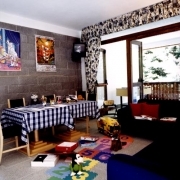 The rooms and junior suites (some with loft) are spacious and comfortable, all with extensive services with hair dryer, telephone, satellite TV, radio, music, safe, refrigerator and terrace. The main peculiarity of this country is the population, which belongs all'etnia Walser, language Titsch (a variant archaic dell'alemanno). 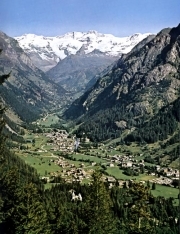 This has obviously given the whole history, religious and civil: from northern Europe through the high mountain passes, Walser have always maintained links with the lands of origin or as a destination for seasonal migration, both as an object of trafficking trade, so that the valley was called Krämertal that is downstream of the merchants. Even today we can admire the characteristic stadel, rural buildings that are based on short columns stone shaped like a mushroom. Highway A5 Turin-Aosta, exit at Pont-Saint-Martin, here take the regional road for the Gressoney Valley.